Water permeability, filtration ability was also good. It is easy to use if there are some variations of length. This review is about item#45501032. I am making it as a primary filter as a filter of mountain water of my parents house in the mountains. I will remove it when it becomes clogged, and I am using it again. This review is about item#45501093. The goods arrived safely. I was able to do a very trainable transaction, which was very good. Also, I would appreciate it if you have the opportunity. This review is about item#45501084. 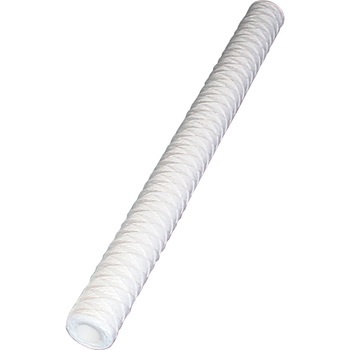 Medium filtration at the time of filling alcoholic beverages, 0.5μ 20 inch is used for finishing, but the price is also reasonable and optimal for medium filtration. This review is about item#38849894. I use a filter unit for water conversion by maker called marfeed, but since I purchased it because genuine products are expensive, it is inferior and price is also cheap, so it is useful. Even water containing considerably mud and garbage will be beautiful. In this environment, 100 μm is practical because clogging occurs immediately at 50 μm or less. This review is about item#38849912. Removing fine particles with the finest filter. Because it is a thing to exchange regularly, it is very helpful to cheap. The thickness and spacing of the thread wound as 0.5 μm were the same. Is the hardness of the roll different? It is the impression. I am satisfied with COSPA. This review is about item#38849885. The yarn winding is firm and firm. I was surprised that there was an object of 0.5 μm. I am using it for taking water mud. This review is about item#38849876. It is used for the prefilter of weakly acidic hypochlorous acid water generator. It is a product which has no problem at all compared with other brand products. From our method of use it will be more helpful if there is something more coarse (150-200 μ). The product itself is satisfactory, although price is also cheap and satisfactory. Although it can certainly be used in a 20-inch product, it could not be used unless 4 pieces of 2 mm spacers were put in order to use it in the filter housing for 20 inches of the same Osaka soul. I think that it is simply a matter of specification but it is displayed as 20 inches. It is not confusing if it makes it a product based on 508 mm in total length, so I think that it will be a more user-friendly product. We would like to ask manufacturers to make improvements. This review is about item#38849903. It can be purchased cheaply, performance is also no problem, it is a repeat decision. It is used for filtration equipment of well water (drinkable). It was cheaper by 200 yen at the price of one around than the estimate that I gave to a businessmen. I was surprised at the price for a moment. Other products also got interested. Because it is cheap, it is saved. It does not feel that it is so inferior to the performance / usage time co-maker product. First of all, it is cheap! I was surprised that this one is 1,150 yen because I bought it for 3000 yen as one manufacturer as I was told. Until now I was thankful to wash and use it with a high pressure washer until it became rumbling. You can exchange without hesitation. This review is about item#45501041. Since it was "Filtration of solvents and oils", as it was used for MEK paint, eluted materials were generated from the filter and could not be used. I would appreciate it if you can display an unusable list. The price is also cheap, it is a good product. This review is about item#40249167. Purification of well water other than drinking water. This time, this is used as the primary filter. I think it's a nice choice. Depending on the time it is quite dirty, so it seems that the eyes of this order are good. Regularly used as replacement in the manufacture of water. Although there is no problem, I think that it would be better if this price range could eliminate even smaller ones. It is a consumable item.